One of England’s few remaining fully operational nineteenth-century windmills, Whissendine Windmill has towered over the village of Whissendine for more than 200 years. Today, fully restored, it produces plain, strong white and wholemeal flour. 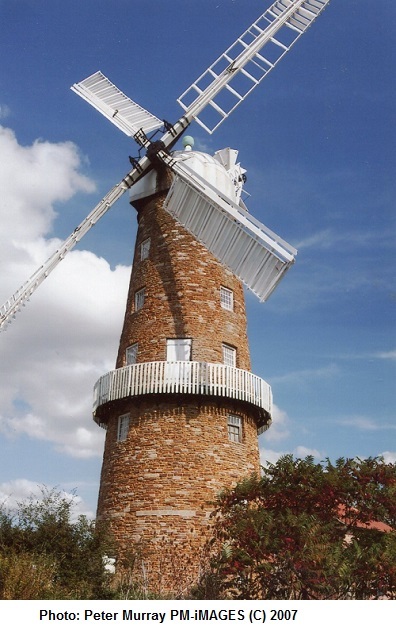 The Mill was built in 1809 by the Earls of Harborough of Stapleford Park to replace an earlier windmill. The tenant Millers were Arnold and Hayes. The Mill was sold to Stephen Whitehead of Gedney, Lincolnshire, in 1862 who refitted the Mill. Later Thomas Hayes bought the Mill, later selling to Eli Kitchen, but remained as a tenant. Many of the repairs to the Mill were by Elsam of Stamford. The Mill worked up till 20 April 1922 when it was damaged in a gale and not repaired. Later owners maintained the Mill until it was sold to its present owner Nigel Moon in 1995. Since then a new top has been made including four new sails. The Mill worked again on wind on 14 August 2009. The Mill has a very fine set of machinery including a smutter, four sets of millstones, three flour dressing machines and a Wegmann roller mill dated 1877. The Mill works all year producing bread and pastry flours, spelt and barley flours, ryemeal and oatmeal. Also available are middlings and bran for pigs, chickens and horses. Visitors are welcome when the Mill is working. Whissendine flour is available for purchase at Whissendine’s Mace village store.